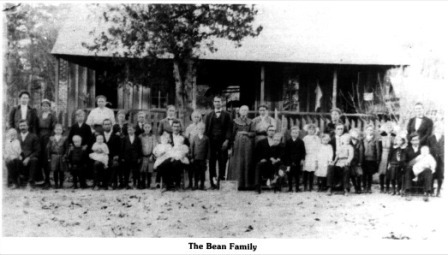 Home Grapeland Family History Bean, John E.
John E. Bean’s ancestors came from Scotland and settled in South Carolina about 1775. In the year of 1852 they Moved to Magnolia Springs in Jasper County, Texas. John E. Bean was born June 22, 1851 and grew up in Jasper County. He married Eunice Ferrell and they had six children. They moved to Grapeland in 1877 and purchased a tract of land one and one-half miles north of town. They lived the remainder of their lives on this land. Their children did not receive a rich heritage in worldly goods but received much love and Christian values. John was a farmer, public surveyor and Baptist preacher. He spent much of his time riding horseback to preach in small churches all over the county. Most of the farming work was done by his five sons. The eldest son, Edgar, was born in 1873. He married Darlie Guice, and they had two small children, Madge and Milton. Milton died at an early age. James A. (Jim) Bean, the second son, was born in 1876, and he married Nancy Herrod. They had six children: Edith, James Oakley, Jossie, Truett, Euvada, and Sammie. Jim lived his entire life on a tract of land adjacent to his parents’ farm. The third son, John Ilai, was born in 1878 and he married Letia Walling. They were the parents of nine children: Beatrice, Cecil, Otho, Ausy Evelyn, Ivy, Elbert (Noodle), Melba, Theora, and Ineta, who died as an infant. John Ilai died in 1962, and he also lived his entire life on a farm adjacent to his parents. Letia lived to the age of ninety-eight and one half years. The only daughter of John E. and Eunice Bean was Lennie. She married James (Jim) Kolb and reared nine children: Clarice, Bertice, Orine, Earline, Aldee, Novidene, Leburn, Vonnie, and Hayden. The fifth child, Mae Bean, was born in 1880 and married Fannie Tyre. They were the parents of seven children: Edens, Florine, Madie, R.B., L.Z., Dimple, and Wayne. Mae died at the age of forty-one years. He lived on property adjacent to his parents his entire life. Zay, the youngest son, married Lillie Bragger and they were the parents of four children: Arvel, Carroll, Eola, and Bonnie Jean. Zay moved his family to Livingston and lived out his life there. It is interesting to note that three of the sons bought property adjacent to their parents, John E. and Eunice. The children lived out their lives on said property. John E. has two granddaughters living in or near Grapeland: Madge Dauphin, daughter of Edgar and Darlie; and Theora Brown, daughters of Ilai and Letia. Theora and husband Travis Brown live on the home place her parents bought in 1900, soon after their marriage in 1899.